Usina do Gasômetro, Porto Alegre, Brazil. Then, a dirty methane power plant producer; now a beautiful museum and art events space. It’s a common place in Photography the statement that there is that one special moment to take a specific picture, that decisive second where everything conspires to perfection. Not that there aren’t any other moments to take that picture; on the contrary. It may have many other ones, but some of them bring an effect that is so special that the images just jump out and become the ones by excellence. It does not matter whether the scene is observed at its very small details before the final click or there was just that positive accident; the ideal glimpse is always there. Practice is our ally to find out this very precise instant. At least, that is what great photographers say! 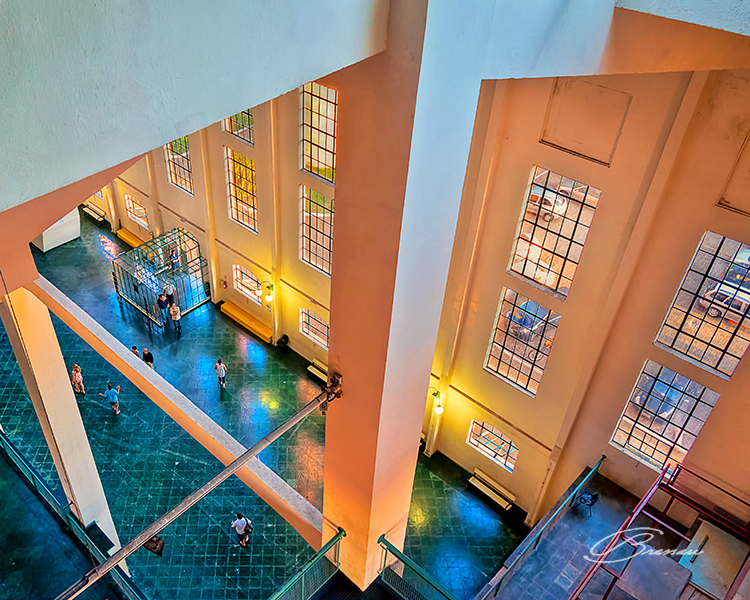 Inside Usina do Gasômetro (Gasometer Power Plant), Porto Alegre, Brazil. When one does not know it, one must resort to choose a simple occasion where the margin for errors is very large. And, this situation presented itself to me when I went back to visit Porto Alegre and its wonderful and famous sunset. I say I would not make a mistake because the sunset is there almost everyday that does not rain, because it happens almost at the same time (it is so obvious!) and it lasts long enough to allow photographers of all levels to profit from the Sun setting over Rio Guaíba. Porto Alegre, Rio Grande do Sul provincial’s capital, South Brazil, lies along the right side of Rio Guaiba, which in turn makes up Lagoa dos Patos, one of the biggest in the world. Therefore, although there are many places to see the sunset in Porto Alegre, one of the best places is Ponta do Gasômetro, called this way because it is where the old building of “Usina do Gasômetro” is situated at an “elbow” on the shore. 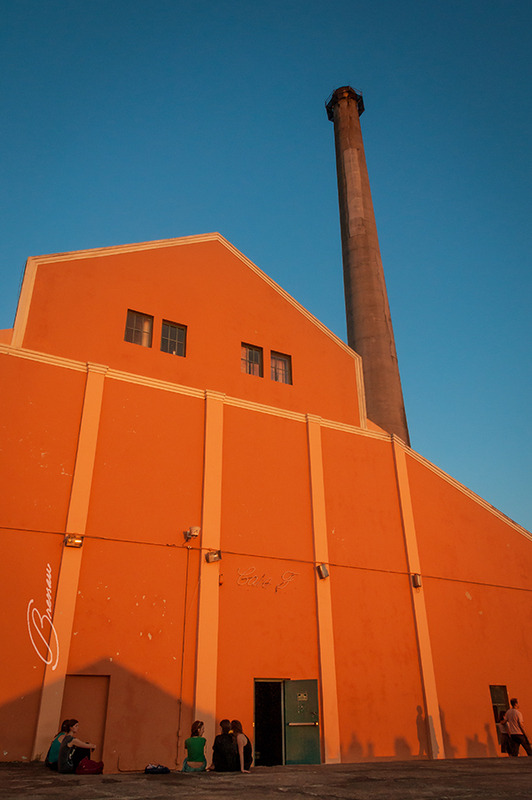 This power plant, in the beginning of the last century, produced piped gas from charcoal for commercial and domestic use. Today, the whole area has been reshaped and became a very touristic attraction to know Rio Guaiba, along with recreation areas, while the power plant building was transformed into theatres, expositions, meeting points and other cultural activities. Some old installations to store and burn the charcoal are still visible; the remaining parts ruined when the production of gas was no longer profitable with the advent of cheaper oil and the building was abandoned for quite some time. History is still present at Rua da Praia (Shoreline Street), Porto Alegre, Brazil. All set, I went there to try my luck and learn a bit. On my way, while walking by Rua da Praia, I went back in time and my many years living in Porto Alegre flashed back. The old buildings, most of them very well renovated, the cobblestone pavement, the movie theatres now transformed into other commercial activities, the many traditional stores, people sitting at the benches on Praça da Alfândega now under renovation… And, what I always liked to do, was to observe all the people walking there as most part of Rua da Praia is reserved for pedestrians. 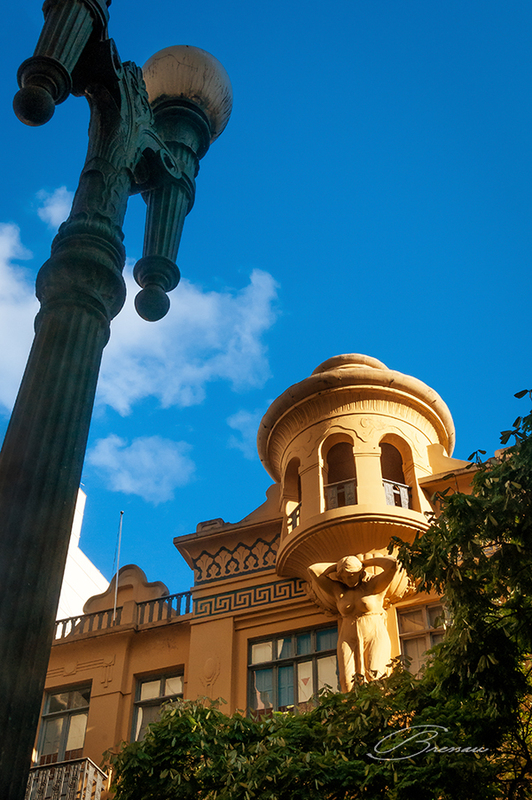 Along the way, I visited Mario Quintana Culture House, where the same name poet Mário Quintana lived many years when the building was still a hotel; its many rooms were transformed into restaurants, theatres, cultural and leisure areas. 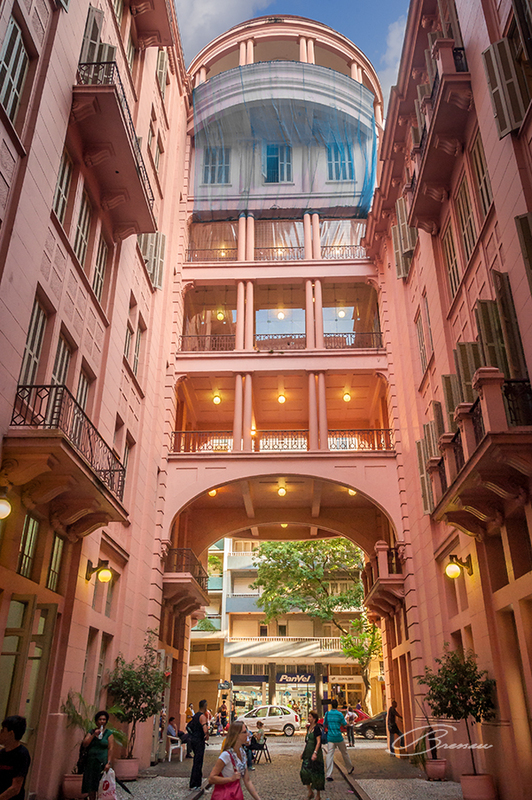 Majestic Hotel, Porto Alegre, Brazil. By the way, the whole area and that is where the name Rua da Praia comes from, was the shore of Rio Guaíba a century ago, where the “good” people of the city used to rest and profit from the Sun and from the calm water of the river. The main gate of Hotel Majestic, for example, led directly to the water and its guests arrived and departed using boats. Along the years, successive landfills pushed the shore hundreds of meters down until the actual peer was built. I noticed, the old buildings still have their original character throughout constant renovation amidst plenty of green. I also realized and that seems to be very odd, that I never took a nice picture from the sunset while living there. I must admit that Photography was still dormant and, because the sunset was always there, I never took action to seriously pursue the idea. Now, that was my revenge time! I wanted, in just few hours, fulfil everything I never did in the past. I was anxious because I could not miss it as I was scheduled to depart within a matter of days. At the Sunset, slow touristic boats sailing through Rio Guaíba. Nevertheless, the afternoon was not lost because I saw a very nice photography exposition in the building and, after hours, there was an itinerant theatre presentation where the actors were walking and acting while the spectators were following them behind. 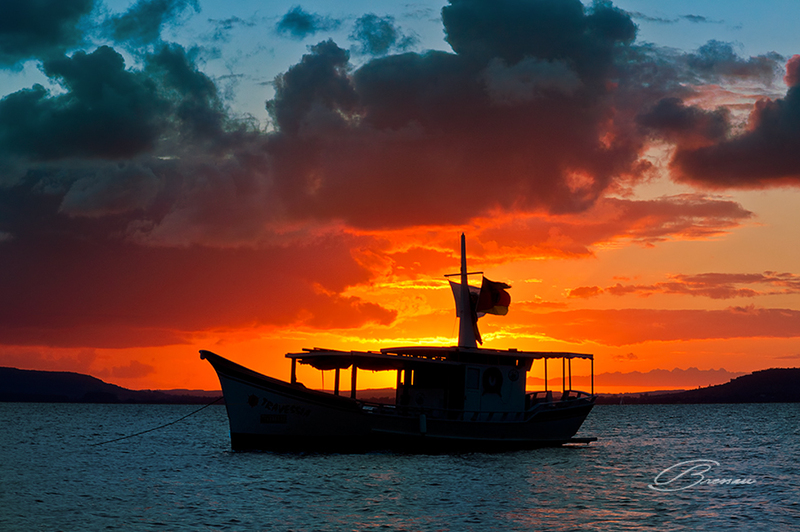 Sunset at Guaiba River, Porto Alegre, Brazil. I promised to myself to come back the next day but the rain was not in my plans. Instead, I visited Parque Moinhos de Vento a few blocks away from my hotel. This park, formerly a horse racetrack, through an urbanization process, became a big green space and recreation area. Its name from the existence of some windmills in the place; sadly, today, there is only one without its paddles. Just like in my childhood, it is still possible to get, in the parks, “sweet cotton” made of melted sugar that is blown through holes in a spinning wheel. This resting young lady sells it. My last day in the city promised nice pictures as the weather was very clear and warm. Almost at sunset time, the sky became somewhat overcast and, from my hotel room, I could only guess Sun’s position and shape because of a large building at the distance. To my dismay, the sky scene that I could see was not much different from the one at the day I went to take the disappointing pictures which led me to think that maybe it would not be worthwhile the trip to Ponta do Gasômetro, around 20 minutes by taxi to there. I waited a bit, continuously looking at the building hiding the Sun, guessing what would be behind it. Meanwhile, I started getting hungry, hungrier for food more than for photos. Eventually, the last look at the sky told me to cease my anxious wait and go to the restaurant. The opportunity for photos was over for the day and for that visit to Porto Alegre. 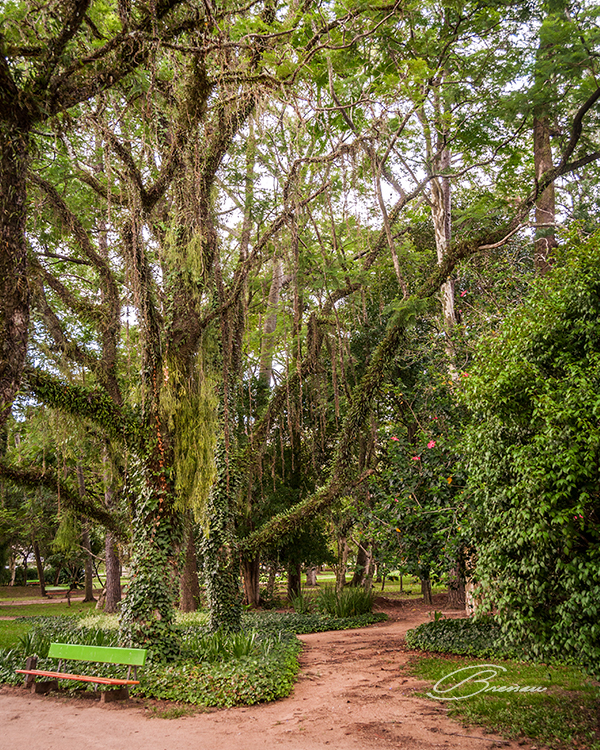 Windmills Park, Porto Alegre, Brazil, with its very old jacarandas. At the restaurant’s terrace, while I was enjoying a delicious bologna spaghetti with good wine, I started noticing that the tip of some buildings around were becoming yellowish, then orange and, finally, almost burning. Almost shocked, I realized what was happening: the sunset at Rio Guaiba in Porto Alegre was there again and tricked me! Although I could not see it because of the many buildings, I knew that it was there. I knew that the Sun, in the shape of a big orange and red-burning disc, was dying again somewhere in the waters of Rio Guaíba, just like many times I saw it before. Slowly, while I was finishing my meal, so were the colours on the buildings fading away and loosing their appeal. The beauty show was over; a show that I could only create in my mind but not register with my camera. I stood long time with my mind spinning, over and over, on last day’s happenings and always culminating by pitying myself for loosing the spectacle so much awaited. “Sorry, Sir, may I offer you a coffee?”. The waiter brought me to reality. One day, I will go back to Porto Alegre and I will try not to miss that special moment again! The attempt, here, is to give an approximate translation of the proper names and situate them in the context. Mário Quintana: famous poet that lived almost all his life in Porto Alegre and, in his last years, as a guest of Hotel Majestic. Rua da Praia: “Beach Street”. Originally, it was a street running along the beach; later, landfills moved the shore to hundreds of meters away.